Tragic heroines of ancient times don’t tend to get fair portrayals in art, take Ajax and Cassandra for instance. Harriet Hosmer loved tragic heroines, but she wasn’t a fan of their depiction either. So she made Zenobia in Chains, and the concept of a queen/captive retaining her dignity baffled the public upon release. 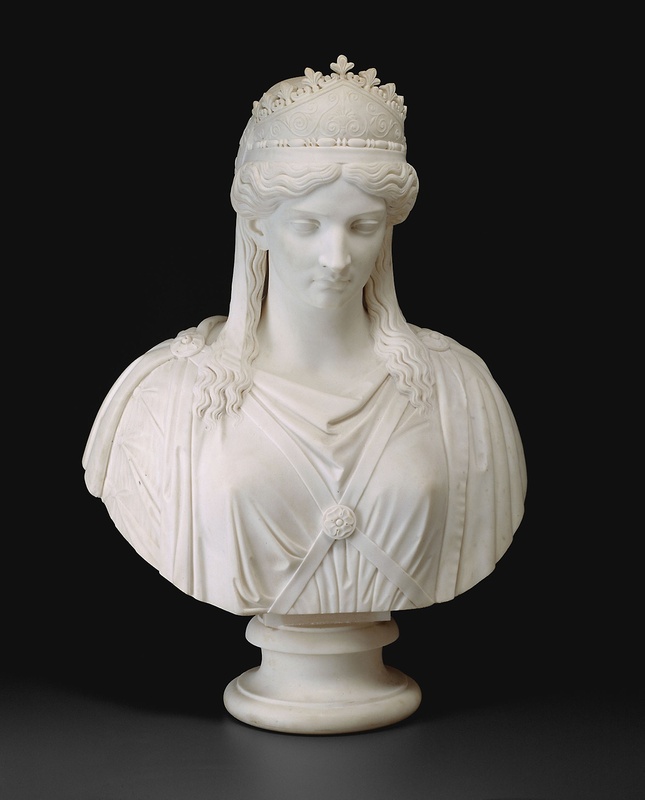 This bust, titled Zenobia, Queen of Palmyra because it doesn’t have the chains of the original, is one of several reproductions Hosmer was commissioned to make. The popularity of the original statue probably influenced later sculptures such as The Spirit of Lilikumoi. Zenobia was highly regarded for her bravery as queen of Palmyra in the third century. She proved the extent of her strength and ambition after her husband was murdered. Everyone has their own way of grieving, Zenobia’s was to conquer Egypt. She proclaimed Cleopatra to be her ancestor and thought ruling Egypt to be her destiny. While her supposed lineage can’t be proved or disproved, Cleopatra would most likely have welcomed her to the family had they gotten to meet. After a few years of conquering, she had full control of Egypt and the Roman empire was too distracted by other wars to consider her a threat. Since the Roman Empire chose not to oppose her, Zenobia continued expanding her territories in defiance of her late husband’s former alliance with them. It wasn’t until a new general named Aurelian was put in charge that she finally got the attention of their armies. The final straw is said to be when she publicly declared her son to be “Caeser.” Even when faced with a massive Roman army Zenobia refused to cower or admit defeat. The battles did not go in her favor though, each skirmish resulted in her armies being pushed further back until the Romans had her surrounded in the capital city of Palmyra. While trapped under siege she announced to Aurelian that like her ancestor Cleopatra she’d rather die than let them defeat her. Unfortunately, she was caught in her attempt to flee the city and this led to the moment depicted in the bust. She was put in gold chains and adorned in so many jewels it was reportedly hard for her to walk. In the midst of an overly lavish Parade of Triumph, she was the focus of attention. This got Aurelian in trouble. The Senate was not happy with the expense and time spent on defeating a woman. Aurelian had to go on the defensive and sing her praises to a degree that reads like a love letter in the Historia Augusta to justify his campaign and capture of her. Zenobia decided to capitalize on the sexism of the Senate and told them that as a mere woman she couldn’t possibly be the mastermind that Aurelian claimed. This, by most accounts, allowed her to safely avoid execution and presumably piss off Aurelian. But, it's also possible none of that happened. Some accounts differ and say that she did indeed die before they were able to capture her. Supposedly, she took her own life in a manner that mirrored the Death of Cleopatra. Either way it can be agreed that she was a powerful conqueror who succeeded in leading armies and heckling Rome for years. Barris, Roann. Harriet Hosmer: Sculptor. Accessed October 17, 2018. https://www.radford.edu/ rbarris/Women and art/amerwom05/HarrietHosmersculptor.html. Fraser, Antonia. The Warrior Queens. New York: Anchor Books, 2004.
" p65 The Lives of the Thirty Pretenders." Historia Augusta • Lives of the Thirty Pretenders. Accessed October 17, 2018. http://penelope.uchicago.edu/Thayer/E/Roman/Texts/ Historia_Augusta/Tyranni_XXX*.html.